There are two computer screens on the desk of Christine Micheel, Ph.D., one constantly monitoring the Web traffic on MyCancerGenome.org. “I can see how many people are on the website right now and where they are in the world. We get about 1,000 visits every day, and less than half are from the U.S. International visitors are frequently from the U.K., India, China and Germany,” Micheel said. Micheel is managing editor of My Cancer Genome, the online tool run by Vanderbilt-Ingram Cancer Center (VICC) that helps physicians, researchers and patients track the latest developments in personalized cancer medicine and connect with clinical research trials. “Right now we have information on 19 diseases and 42 genes, but we would like to expand that to 100 cancer types and 500 genes,” Micheel said. As managing editor, Micheel oversees the operations and feature set of the website as well as its content. She also manages business opportunities, like a new partnership with the company GenomOncology, which includes use of My Cancer Genome in decision support tools and licensing of My Cancer Genome content onto other platforms. Micheel is also working with the Knowledge Management Team at Eskind Biomedical Library to create videos that explain genetic terms to lay readers. Growing up in Marshalltown, Iowa (population 27,600), Micheel wanted to be a dentist as soon as she got braces in fourth grade. But an inspiring chemistry teacher in high school shifted her focus. She majored in chemistry at Washington University and then went to the University of California, Berkeley, for graduate school. Her work there and at a postdoctoral fellowship at IBM focused on nanobioscience—getting tiny molecules to arrange in useful patterns. It was undoubtedly cool science, but Micheel wanted to have a career that tangibly helped people and benefited society. She was driven by her mother’s ovarian cancer diagnosis and the death of a close friend in a car accident. “Both of those events together really made me feel like there wasn’t time to waste. I felt that the time to do something useful and good is now. You can’t wait around,” Micheel said. She decided to work in health policy and received a prestigious fellowship at the Institute of Medicine’s National Cancer Policy Forum, which happened to be chaired by Hal Moses, M.D., director emeritus of VICC. 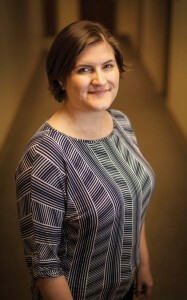 After Micheel’s husband Steven Damo joined Vanderbilt for a post-doctoral fellowship in 2010, she asked Moses about opportunities in Nashville that could tap into her policy expertise and love of science and data. My Cancer Genome had just launched and “the rest is history,” Micheel said.